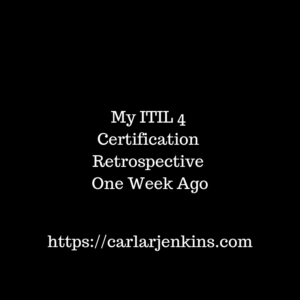 I received my ITIL 4 certification one week ago on Sunday, March 31, 2019. Obtaining it has exponentially increased my IT service management opportunities. ITIL 4 is the new edition of the certification exam. It will replace ITIL 3 (which I already have) in June 2020. I have decided to get my ITIL 4 early because 1) you will have to get it anyway and 2) getting it early lets me stay current. I love being current and ahead of the trends because this keeps me relevant. Check Out My Video Below and subscribe to my YouTube Channel for latest in all things project management and IT service management.